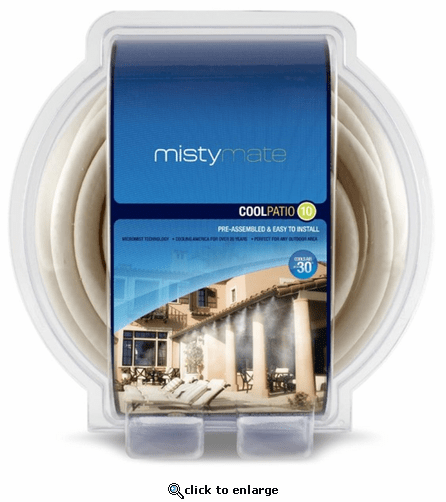 MistyMate Cool Patio Systems are pre-assembled and easy to install! Upgrade your outdoors with the power of mist. This professional grade Cool Patio 10 system provides a cool environment from the heat for your favorite outdoor areas. This high-quality pre-assembled system comes complete with 6 of our exclusive micro-mist nozzles that deliver a continuous stream of ultra-fine mist, cooling ambient temperature up to 30 F Once the mist hits the air, it flash-evaporates on contact ensuring a mild climate in even the hottest environments. This high-quality pre-assembled system comes complete with 6 of our exclusive micro-mist nozzles that deliver a continuous stream of ultra-fine mist, cooling the ambient temperature up to 30\xC1F. Once the mist touches the skin, it flash-evaporates on contact ensuring a mild climate in even the hottest environments.